Irving is covered to some extent by the travel services run by the Dallas Area Rapid Transport system and can therefore boast some degree of efficiency in its transport infrastructure. Combine this with Irving's reputation as a driver-friendly city and its proximity to the Dallas Fort Worth International Airport and you will appreciate how negotiating Irving from a transport perspective is a relatively stress-free affair. Dallas Fort Worth International Airport lies between the cities of Dallas and Fort Worth and while it is not considered an important US air hub, it still traffics 1,500 flights per day to a variety of destinations, both international and domestic. Shuttles, taxis and limo services provide ground transportation from the airport to Dallas, Fort Worth and Irving, while the Trinity Railway Express service runs into downtown Dallas. For further information about the airport, please visit the Dallas DFW Airport Information travel page. If you want to take advantage of the amenities of nearby Dallas, then a rental car is a good idea for visitors to Irving. Rentals are available from both the airport and downtown establishments. 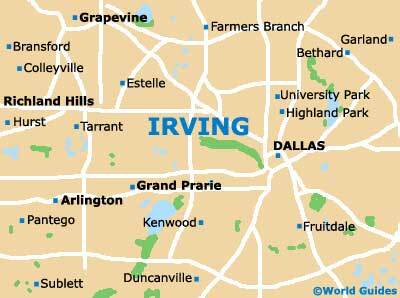 Irving is served by I-30, I-35 and I-635. Driving conditions in the city are relatively sedate in comparison to those of Dallas. Book your Dallas DFW Car Rental here. The Dallas Area Rapid Transport system, or DART, serves Irving as well as 12 other cities in the Dallas area and provides rail, bus, paratransit, HOV lane and rideshare services. Greyhound buses also provide services to neighboring cities and destinations farther afield. While DART does run some rail services into Dallas and other nearby cities, it does not currently offer connections to Irving. 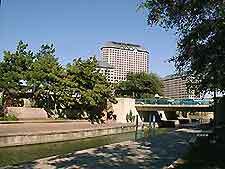 Metered taxi cabs are available in Irving, but may only be hailed from selected destinations such as the airport, hotels and the Las Colinas Urban Center. Travelers wanting cabs from other destinations are advised to call and pre-book.